Home made foods do taste better and once in a way something totally random really rubs that fact in. I, like a zillion other people, had been enjoying kokum sharbat out of a mini jerry can and had taken it for granted that it was quite nice. It was. And then I had home made kokum sharbat made by Kunda Maushi. Kunda Maushi lives in a village near Chandore and is very fond of the hubby. She took care of him and his team while he was excavating at the archaeological site at Chandore, and fed them good home cooked food an entire season when they couldn't find an alternative. 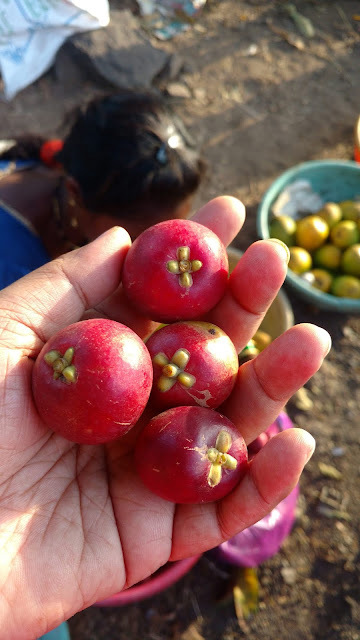 One day as he drove the team towards her house he saw an adivasi boy with a mound of fresh ratambe or kokum fruit harvested from the trees in the neighbouring forests. 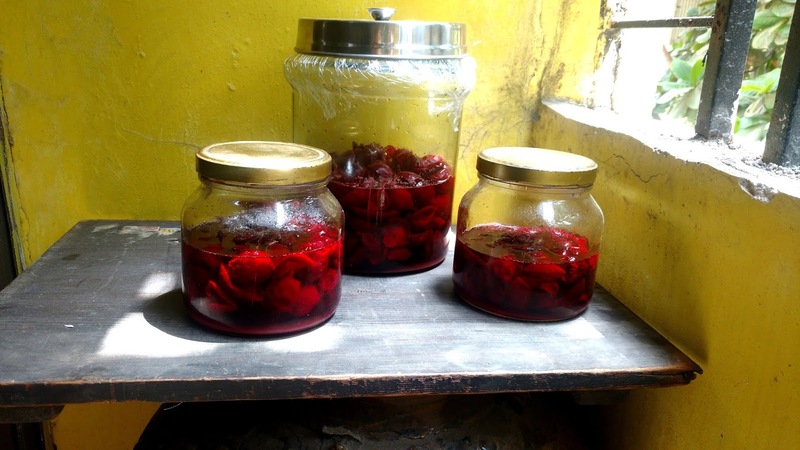 He knew Kunda Maushi would happily do her magic with the fruit and there would be sharbat for sure, and so he bought whatever the boy had, much to Kunda Maushi's delight. At the end of the excavation season he came home with a large plastic canister of Kunda Maushi's home made sharbat. I haven't been able to drink the commercial stuff since then. I did some reading, bugged a couple of friends and set out to make kokum sharbat. The process itself is fairly simple but needs patience, something I'm famous for lacking. But anyway, I was determined to try even though I had way more kokum than I had bargained for. I gave some to a friend and tackled the rest. twice as much sugar as fruit. I used castor sugar. Wash and dry the kokums. Once dry halve each fruit and discard the inner whitish pulp and seeds. Now all you have to do is combine the fruit with the sugar and place it in a jar. 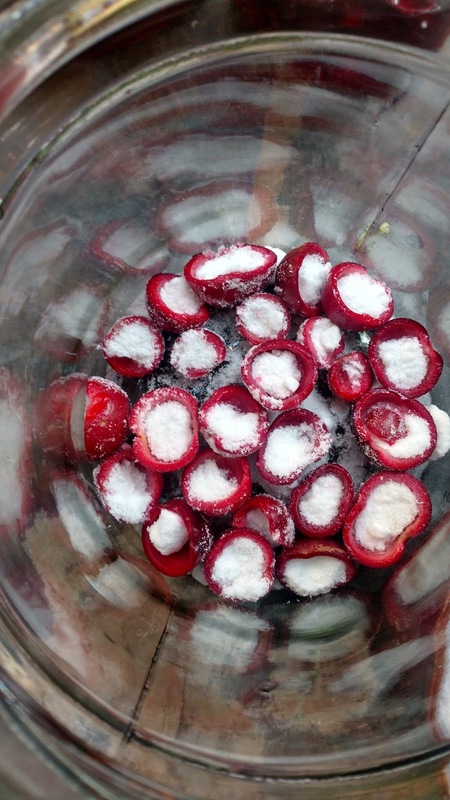 A good way of doing this is to scoop sugar into each half of kokum and then place the filled fruit half in your jar. Layer the filled halves of fruit in the jar and add extra sugar as you go. 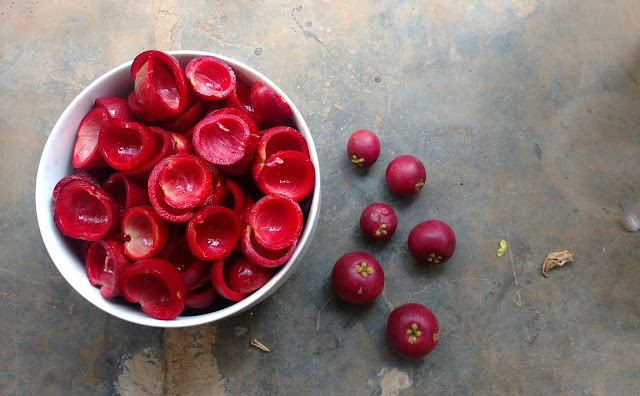 Pack the kokum as tightly as you can and then shut the jar tightly. You can cling wrap the jars before putting the lid if the lid feels loose. 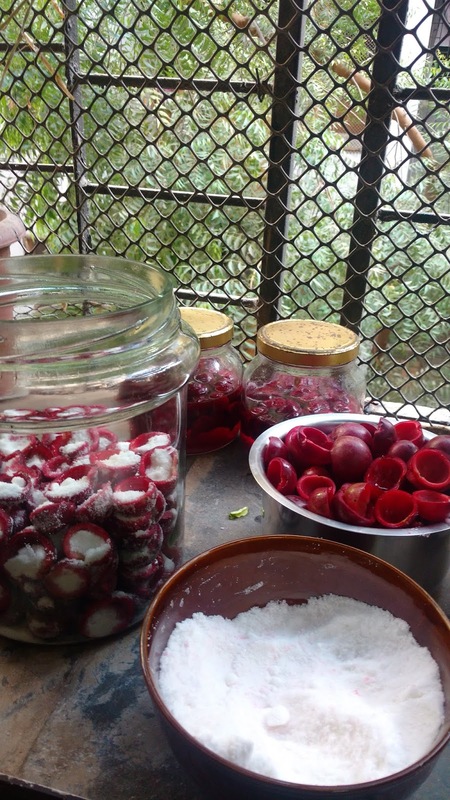 Leave the jars on a sunny windowsill and let the sugar dissolve slowly with the fruit as you can see in the jars below. The fruit will collapse in size significantly in the first couple of days itself. As the fruit breaks down the sugar will combine with the fruit and create a thick fruity syrup. Let it bask in the sun for 4 days to a week. Remember to shake the jars once in the morning and again in the evening. Once the sugar is completely dissolved and only the bare shells of the fruit remain your sharbat is ready to be strained. 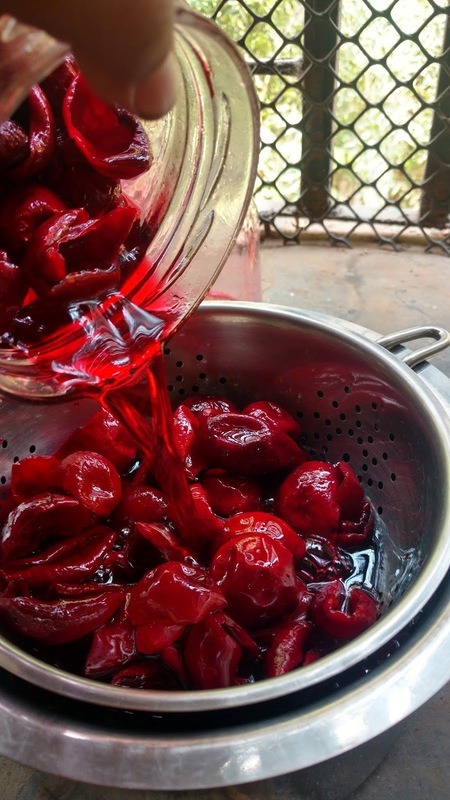 Take a large colander and carefully drain the syrup into a thick bottomed pan or vessel. 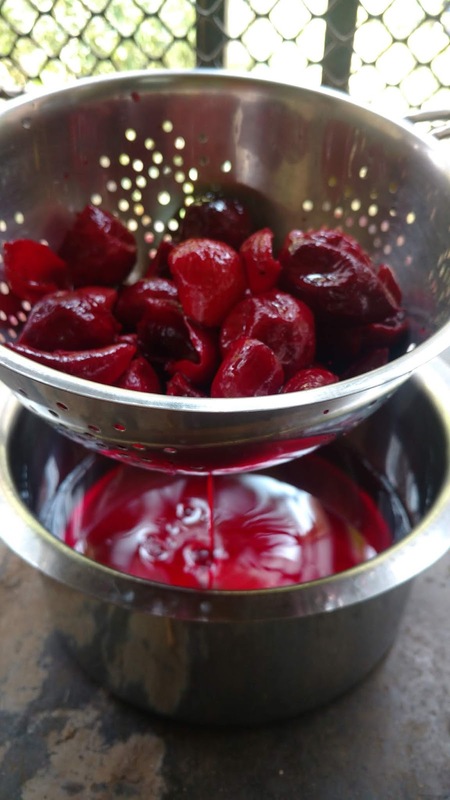 Collect all the syrup in one large vessel if you, like me, have a lot of kokum to process. 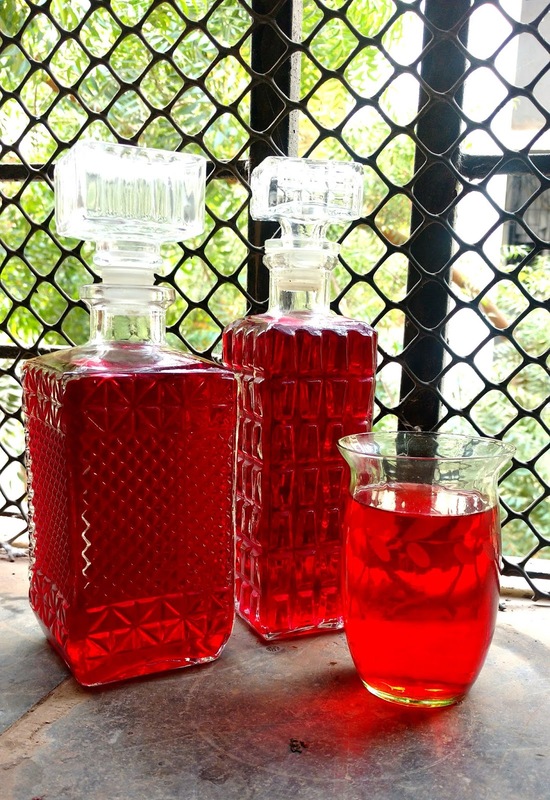 Taste the syrup by making a serving of sharbat at this stage to check the sweetness. You can add some plain sugar syrup at this stage if it's not sweet enough. Bring the kokum syrup to a boil adding a little salt. You can also add some toasted jeera powder if you like. I didn't as the hubby dislikes it. Once the syrup is boiled cool it down completely and then pour into clean bottles and store in the fridge. To make a glass of sharbat take one part of the syrup and add 4 or 5 parts chilled water depending on how strong and sweet you like sharbat. My friend Saee often serves it with soda and a sprig of fresh mint from her windowsill.